Ishan Grover is an expert in brewing and distilling from Heriot watt university Scotland. He has set some of the top breweries in India. Ishan Grover is an expert in brewing and distilling from Heriot watt university Scotland. He started his career with Franchise of Lemp brewing company from St. Louis, USA in Gurgaon in 2011. At lemp Ishan introduced many unique beer flavours like chocolate beer and American pale ale, and became the first brewery to introduce the authentic lagers which were matured for 41 days. 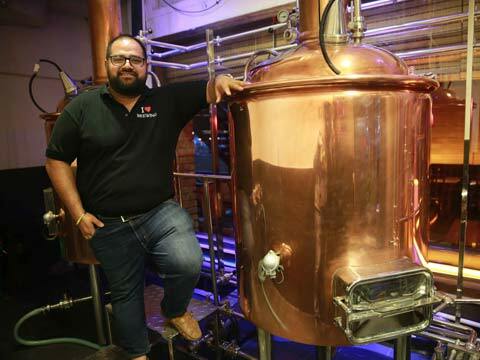 Today, he has set Gurgaon's biggest microbrewery chain “Manhattan Group" which currently have 5 microbreweries in Gurgaon and planning to open few more this year (Manhattan, The craft brewery, Open Tap, Uptown,Bronx). He has also crafted beer for top restaurants in India, including Quaff. Punjabi by nature and Lagom at Sohna Road. What trend do you see in the industry when it comes to drinking culture? Gurgaon is an IT hub and majority of people have travelled abroad or are expats. People already have an exposure to Craft beers from USA, Europe and Germany. Ever since microbreweries have opened up, people have stopped drinking the bottled beer and preference have changed towards fresh beer concept. Gurgaon is the only city in India to have 24 operational microbreweries and many more under construction. It is officially the Microbrewery capital of India. People appreciate fresh beer since it is very light on alcohol, even females really like to drink a lot of fresh wheat beer. How are you promoting and creating awareness about brewing? We conduct brewery walk through and brewing sessions at various breweries, we invite our guests to be a part of the brewing session so that they understand the complexity behind the art of brewing. It is one of the biggest challenges for me to educate people about various beer styles and brewing process, we also conduct one-on-one sessions on special requests. Which according to you is the finest brewery in the area? I strongly recommend Quaff at cyber which has opened just 2 months back, we have done innovations with some really unconventional beer styles like IPA (INDIA PALE ALE) Dunkelweizen ( DARK WHEAT BEER). Wheat, Premium lager and dark lager are very regular flavours found almost in all the breweries but Quaff had set new benchmark with its beers. How do you see beer market growing in India? Currently, Gurgaon alone is producing more then 2-2.5 Lakhs litres of Craft beer each month. At this moment only few state have allowed Microbrewery license, In 10 years when each state will allow the license for microbreweries, The craft beer revolution will be much bigger than what USA and Europe had seen. What is your plan growing your own brand? I am in touch with investors for a funding of Rs 150cr; we are introducing microbrewery chain in small cafe formats like CCD/ Starbucks all across India. Currently we are planning to open the format in Gurgaon and Chandigarh and then we are waiting for Delhi to give permission to microbreweries this year. As a Master Brewer we are expanding our service to other cities as well, we have signed brewery in Pune which is going to be India's biggest Microbrewery which will produce 60,000 litres in a month. I am also doing 2 projects in Bangalore and 1 in Kolkata and Chandigarh. Aurangabad based Kream N Krunch to focus on tier-I..